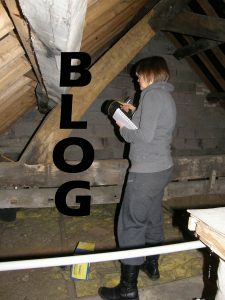 Wiltshire Buildings Record began the Wiltshire Dendrochronology Project in 2009 in co-operation with Historic England (English Heritage). This was funded under the Historic Environment Enabling Programme. 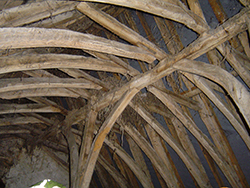 Dendrochronology, the scientific study of tree-ring growth, is very useful as it can provide a felling date for surviving beams and roof trusses. This tree-ring analysis can accurately determine the date of part or all of a building, helping to interpret the historical development of the site as a whole. Phase 1 of the project determined the felling dates of oak timbers in eleven very early buildings, the earliest one being from the start of the 14th century. 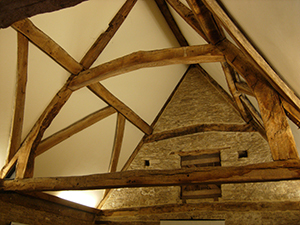 The outcome exceeded expectations and helped us to better understand the chronology of Wiltshire’s archaic buildings including cruck and base crucks. The results were published by Avis Lloyd, then Project Manager, in Vernacular Architecture vol. 44 (2013). Phase 2 ran from 2014 to 2016 with the help of a grant from the Vernacular Architecture Group. Ten buildings were sampled including two which were paid for by the owners and two with part payment by the owners. The results produced date ranges from as early as 1252. 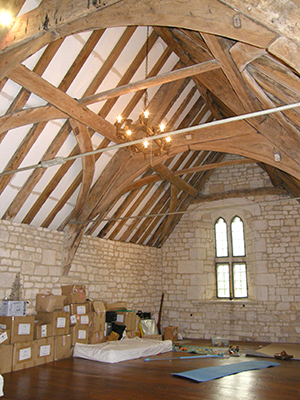 One of the buildings was the National Trust’s Great Barn in East Street, Lacock which is open to the public. The cruck timbers forming the skeleton of this building were found to be felled in 1338-9. Phase 3 began in 2017 funded by a grant from the Pilgrim Trust. Results so far have provided good 14th and 15th century dates. We welcome approaches from owners offering to pay for the dating of their buildings. We can arrange sampling and interpret the results for you. We have had just a few disappointments during the project when medieval timbers have turned out to be elm or coppiced oak with ring widths which differ from the master sequence when scientifically measured. Timbers need to be oak, and of a good size. This is more likely in buildings dating from the 16th century or earlier. Costs can be surprisingly inexpensive. Please contact us for further details.